Sound is all around us but do we ever really listen? If you are one of those people who live in a big city, then it is highly likely that you are constantly bombarded by a vast array of different sounds, some of which seem pleasant and resonate with you, many which you filter out, and yet others which may irritate you somewhat or perhaps drive you crazy. I know from my own experience that I often find the sound of piercing police sirens difficult to deal with. Jonathan Goldman, author of "Healing Sounds" and "Shifting Frequencies", makes the point that all sounds are sacred from the higher dimensional perspective. However, it takes a sizeable shift of one's own frequency to turn the sound of a jackhammer or police siren into something palatable. Indeed, there are many beautiful sounds we can turn our attention to before we tackle the much more difficult task of listening to sounds which do not immediately resonate with us. Hearing is a passive action whilst listening is an active one. It is through the latter that we can begin to awaken our consciousness to the melody and rhythms of life and how everything is interconnected. Listening allows the listener to move beyond the sound into the essence of creation. Rudolf Steiner knew this when he said that the Spring song of birds was the necessary element to bring the plants into bloom. Cutting-edge Science is now beginning to validate the truth that sound creates form. Everything that has ever existed or will exist in this Cosmos is a complex web of interconectedness, woven layer upon layer, frequency upon frequency. Cymatics shows how sound creates the sacred geometric patterns on which the whole of life is built. "An evil man is ensnared by the transgression of his lips, But the righteous will escape from trouble." Let us remember then that we are highly sensitive energy beings expressing through the physical body. 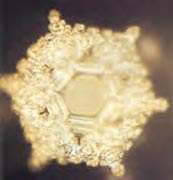 The pioneering work of Japanese Scientist Masuro Emoto has demonstrated the effect of ugly thoughts and harsh words on water crystals. He has shown time and again that the crystals form into ugly, damaged ones. We all know how it feels to receive a kind word and we know how it feels to receive a harsh word. Of course, we do not have to let the thoughts and words of others affect us but we do need to remember that our own thoughts are words are constantly affecting us. Sooner or later we see the effect of this in our lives. We can use sacred sound to bring ourselves back into balance and the easiest way is through using our own voice and clear intention. Whilst remembering the magic formula of Sound + Intention = Manifestation/Healing, we can tap into the power of sound through toning and chanting vowel sounds. You do not need to be properly trained to start this profound work. You just need practice and commitment. Sound clears the static energy of the body, moving through it to create a space for healing to take place. We should remember that we have the underlying tendency to be well and our body has an infinite intelligence that knows how to take care of itself. The reason so many of us suffer in body and mind is because we program our minds with false beliefs and erroneous ideas which flow contrary to the life principle. Sound is a way of bringing ourselves back into alignment with the life force within. To do the following exercise, please make sure you find a safe, quiet space where you won't be disturbed. If you feel self-conscious, then the exercise will not be effective. Do not let others' doubt or cynicism prevent you from self-discovery. Each of our major chakras has been said to have a particular key or note. However, different theories abound as to the correct note. As we are all slightly different in our energy make-up, the best way for you to tune-up your own body is to follow your intuition when toning. Generally speaking, you would start with the base chakra making the lowest note that you can, and then incrementally raise the pitch as you progressively move up to each succeeding chakra. To find the correct pitch, just get your mind out of the way. You cannot think which note you need since you need a right-brained, intuitive method to hit the correct note. Let the sound come from deep inside yourself but there is no need to strain your voice, so choose a level that is comfortable for you and refrain from over-extending yourself. We need to trust and allow ourselves to be a vehicle for sound from the higher dimensions. If we trust, then the "right" note will come out. It may not sound pleasant to our ears but it will be the one that creates the shift. It is important to remember that not all sounds are melodious. Once you are comfortable making sounds, you may also like to experiment chanting mantras (sacred, sonic formulas used in meditations) or sacred words like the Om, which has been called the sound of the universe. Om is the first sound and all sounds have their source in this seed syllable. Feel the O in the cauldron of your belly and let it rise up to the top of your head with the M. Sound the O and close the lips on M, letting the sound circulate inside your mouth. For those of you who are Reiki attuned and know the mantras for the Reiki symbols, it is wondeful to chant the symbols out loud. This can greatly magnify the quality of the Reiki energy coming through. Please take time to rest and integrate the totality of your experience after your session. Also, drink plenty of good quality water afterwards to ensure you are not dehydrated. If you do not experience much during your initial attempts, keep going. The rewards will outweigh the effort.